including three times National Champion. Mateus is a son of Highlander, Australia's most successful stud male. So like farther, like son! Highlander has had a huge influence on the national herd in Australia, until his death last year. 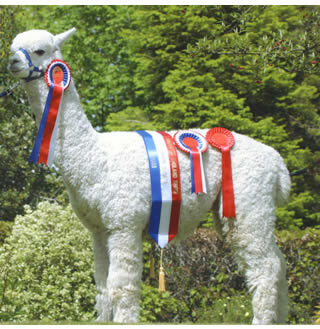 Highlander was a solid white full Accoyo specially selected from Don Julio Barreda’s Estancia Accoyo in Peru, part of an elite group of alpacas imported to Australia in 1990. Aged about fourteen when he died, the last fibre statistics available in 2001 show his mean at 23 microns, SD of 4.9, CV of 21.3% and spin fineness 21. Great statistics for his age, but the real test of a stud male is his progeny. One of his most successful sons is Windsong Valley Iceman, the AAA Supreme Champion. Then there is Purrumbete Brigantine, another Australian Supreme Champion. By July 22, 2002, there were 378 registered progeny –192 females, 173 males and 13 wethers. Of the males 73 have been certified for breeding. Normally you might expect 5% of the male progeny to be good enough to be studs but Highlander had close to a 35% success rate. Mateus represents the first opportunity in the UK for the serious breeder to introduce the famous Highlander genetics into their herd.